This online store takes care of all the needs your pet might have. From food supplies that ensure your pet eats the right balanced diet to veterinary services for when your pet is sick. The personnel working at this company are pet lovers with most owning at least one pet. Their love for animals ensures they take extremely good care of your pet. The services provided by this company are so well organised and thorough that you’d wish such care would be given to you. Dogs and cat are the main animals concentrated on but the company also takes care of horses, pigs, cows, sheep and goats. Some of the services offered are eye and ear treatments, treatments for fleas and ticks, food supplements for the various domestic animals and animal medication. A lady named Laura Schneiderjohn is more than happy to answer any question you may have or information you may require. This store receives so many customers that they have so many reviews made about their store, its products and services. Most of the customers are positive about the store expressing their satisfaction with the low priced products, quick and efficient delivery system and customer care services. They appreciated the easy and fun shopping experience they have on the company’s webpage as well as information provided on it. They also complimented the variety of products offered. One customer who wanted to buy a product that would prevent his cat from pooping on his couch got some great advice from a seller at the store instead of the product. The seller told him to pin a blown balloon onto the spot the poops on and leave it there. The cat blew up the balloon scaring it into leaving the spot and never pooping there again. This shows the customer service at the store is excellent. The seller would have charged the customer for a supply that would not have worked but instead offered him free help. As much as there were positive reviews, some customer gave negative ones. If the store chooses to take into account the negative reviews made, then it would simply become even an even greater and bigger store. One such negative review was from some customers who complained of the expensive shipment of smaller orders. The company needs to lower its shipping price for small orders. Furthermore, they need to educate their staff on basic product knowledge as one customer complained that the products he was asking a seller at the store were either new to him or the seller had no idea what he was talking about. Another customer said the large building could benefit from adding more products for customer and pet needs. 1. Advantage Multi Rx: Cat (Purple), 9.1-18 Ibs is $79.99 from $88.99, Dog (Red) is $83.99 from 89.99, Dog (Teal) is $83.99 from $89.99. 2. Baytril Rx taste tabs: BAYTRYLTT 2271 is $ 97.75 from $107.53 and BAYTRLTT 2275 is $391.63 from $430.79. 3. Capstar: Capstar Green is $269.46 from $349; Capstar Blue is $269.99 from $349. 4. Clomicalm Rx: Clomicalm Rx Blue 20g, 30ct is now $29.99 from $35.47, Clomicalm Rx Purple 40mg, 30ct tablets are now $34.99 from $46.46 and Clomicalm Rx Green 80mg, 30ct tabs from $57.72 to $47.70. 5. Cosequin soft chew dogs at $37.60 from $53.73. 6. Curaflex 2 chewable bonelets 120ct is now $25.87 from $30.13. 7. Eazi-Breed CIDR (Progesterone)-10ct is now $148.85 from $156.91. These are just some of the great special offers the website offers. They deliver these products for free. 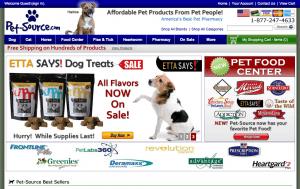 The company has got a lot of customers that love their pet products. They are open to ideas from the public and take the customer’s complaints into consideration. This might be one of the main reasons the company is loved by so many customers. It received a high trust score that proves the company produce real products and not fake ones. When it comes to business transactions, they will not run with the customer’s money as they ensure their customers receive their products and on time if not earlier. The company was listed as an UNAPPROVED pharmacy by legiscript.com as it did not meet their standards. This is because the website provided information that could be gotten online by anyone. They need to provide information that is limited solely to the site. Otherwise, pet-source.com gets 3 stars.